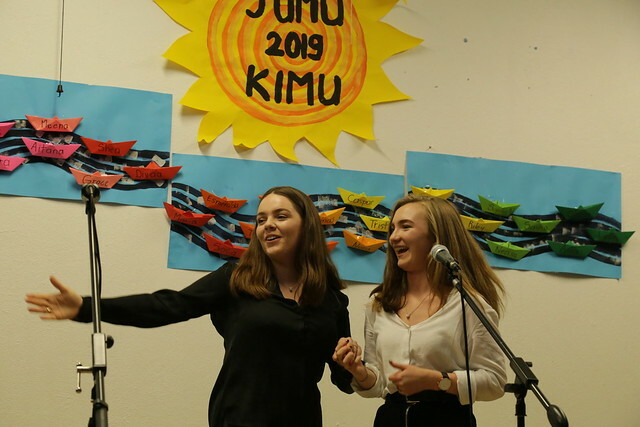 Almost fifty of our pupils took part in this year’s Jumu and Kimu music competitition on 24th and 25th January which concluded with a fantastic concert on the Friday night. The school community got to enjoy some outstanding singing and instrumental performances by pupils of all ages, from some of our youngest to 12th class students, and were also treated to a variety of songs from Pocahontas performed by our Primary School choir. This is one of the biggest and most popular events on our school calendar and a big thank you goes to Frau Thielemans and Ms Brennan who put a lot of effort into organising this competition and concert every year. Thank you to the German Embassy for sponsoring the event and to our school canteen for preparing snacks for the reception held after the concert. Thank you also to Maehbh and Leah who presented the concert and of course to all the pupils who took part! In her closing words, our Principal Alice Lynch also thanked the parents who commit to their children’s music education, thereby enriching life at St. Kilian’s for everyone. The perpetual Jumu trophy was awarded to Tristan Spellman Molphy and Daniel Partridge this year who have both been great contributors to the Jumu competition over the past few years. Thank you for your commitment! More information on Jumu and Kimu is available here.